Welcome to Agency Advantage Tools, a regular blog series at Convince & Convert that spotlights inexpensive or free digital marketing tools. There are literally thousands of different Web sites, applications, plug-ins, widgets and more devoted to helping digital marketers do their jobs better or faster. Most advertising agencies and PR firms are too busy doing actual marketing to keep up on this flood of innovation. So, here at Convince & Convert, we’ll do the work for you. We’ll scour the Web to find the tools that are worth adoption at agencies. Today’s tool is Website Grader. This exceptionally easy-to-use Web site shows you in an instant how your site, your clients’ sites, and/or your competitors are doing with regard to search engine optimization. Website Grader is owned by Hubspot, an integrated, Web-based suite of tools for search, blogging, social media, content management, and competitor analysis. 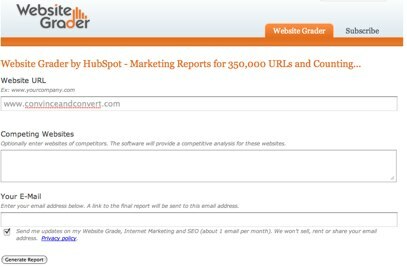 We’ll review the full Hubspot offering in a future edition of Tools You Can Use. Website Grader takes information that has been in demand for years (number of links, page rank, metadata, etc.) and presents it in a very clean, easy-to-understand format. There have been a number of sites that provide portions of this data, but none with the savvy interface and non-SEO-professional tone. You just enter your Web site’s URL, enter the address of competitors if desired, provide an email address (if you want a printable report), and click “Generate Report”. That’s it. Analysis take about 30 seconds. All of the data presented is interesting, with some of it quite useful. For example, inbound link count, alt image tag assessment, and keyword grader are useful measures. Being alerted to the fact that this site doesn’t have a contact form is less useful. Clearly, we are already aware that we (purposefully) don’t have a form on Convince & Convert. While the scoring system is no doubt arbitrary and subjective, Website Grader does provide a summary score (on a 100 point scale) of how each site is doing. Convince & Convert gets just a 59 for now, as the newness of the site and subsequent lack of Google Page Rank and other key metrics no doubt hurts our score. While Website Grader might provide data that is mostly already known by studious professional SEO types, for agencies that are analyzing their own sites or client sites, it’s an extremely powerful tool that we wholeheartedly endorse. The fact that Website Grader provides recommended improvements for almost every data point is a real plus, making this a key Agency Advantage Tool and one that deserves an immediate bookmark (you can actually bookmark your specific report, so you can check back on your progress every couple weeks). Leave a comment and let us know your Website Grader score.